Globalization of business is going quite well but globalization of work force is still very slow. Global talent development is an urgent need, but do not know where to start. Employees generally dislike overseas assignments and do not opt for overseas assignments voluntarily. During their stay overseas, many expatriates are stressed out. The conventional global talent development trainings are not good enough to develop the global talent that they are looking for. So what are the companies looking for? Employees who enjoy working in an international environment and are also successful in business. Real work experience, not just a case study! A program with more hands-on experience, that is extremely important to be successful in business. Experience of working in emerging countries like China, India and South East Asian countries bustling with action. A program with proven results, designed with several missions (tasks) that are given during the the 5 days and which need to be completed within a short period of time. We give missions that are achievable but very challenging. The missions can be accomplished unless the trainee interacts with the local people and gets co-operation from them. Since there is no way to escape, the trainees have to complete their missions with complete seriousness. Daily coaching and field work help in strengthening their abilities. Listening to the Japanese top management people working in local environment, trainees get motivated to work overseas. Work experience outside Japan leads to confidence building. Real Work Experience, not just a case study! A program with more hands-on experience, that is extremely important to be successful in business. 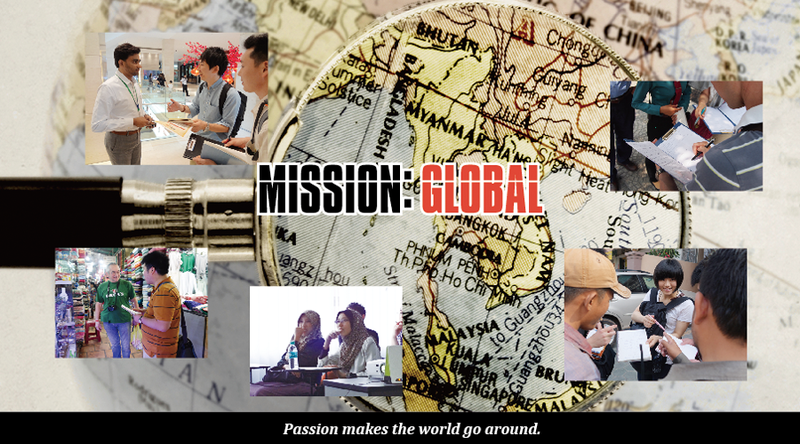 Unlike the case studies of MBA, the trainees are required to complete "missions" in an unfamiliar loacation. Accomplishing these missions gives them a real business experience. Undoubtedly this experiential training is the most effective overseas training that there can be. In our everyday work, it is impossible to do only one task at a time. We have to multi-task between the various tasks that we are given. In a similar manner, during the MG training many missions are given simultaneously and all the missions cannot be completed unless you do multi-tasking. The missions cannot be completed just by brain work. One needs to challenge oneself and have practical approach to complete the missions. If the trainees are successful in completing these missions they gain confidence to be able to work anywhere in the world. The trainings can be done in various countries in south east Asia, China and India that are bustling with activity. The program is designed such that, in order to complete the ’Final Mission’ , the trainees have to complete the daily missions which actually act as a clue to complete the final mission. Similar to real life business, you cannot complete the’ Final Mission’ without multi-tasking to complete the other mini missions. Additionally the trainees may get a special mission from their company. Though the final mission seems impossible in the beginning, as the trainees complete their daily missions successfully, along the way, they develop their skills and network and then are able to accomplish the final mission as well. The departure date and the period of stay is flexible and can be changed as required. As a company we would like to make progress in the emerging countries but we have only few employees who would volunteer to move overseas. Hence we introduced MG in order to develop the global mindset. We offered MG to 50 of our young employees who have just worked for 2 years in the company so that they develop a international mindset early on. We introduced MG to help our employees to learn about self initiative, practical approach and creativity by working alongwith the people from other companies, in a competitive environment of experiential training. In order to increase the workforce that can actually work in a global environment, we introduced MG so that employees can experience a different culture where Japanese cannot be understood and they have to face a real struggle to be understood. We introduced MG to intsill the quality of courage and stimulate a breakthough in our middle management employees. Our employees do not have to interact with people from other companies or other departments, and generally work alone. Hence we introduced MG to make them experience a completely different environment where they have to interact with many different people and work on hallenging tasks. Since the difficulty level and content of work is different for young employees and management level employees, we can change the missions given during the MG Training programs according to the level of the trainees. Acquire ability to be able to work anywhere in the world. Gain the experience of working successfully with people from other countries. Recently many Japanese companies are working on globalization. We support such companies to develop talent that can be deployed overseas in case of urgent assignments, and also to develop global talent that can work successfully in emerging countries.